← Expat relations: where have my old friends gone? Yay! Raclette! It’s so funny, next to your blog I’m also reading another one which is also about living in France. And recently there was a post about Raclette too! Hello again, Stella! Yes, Switzerland is still on my list of places to visit. I DEFINITELY will try raclette from its origin gladly! ;0). Really, two posts on raclette, huh? Well, what do you know. I will have to check that one out too. Oh, and by the way, Happy Belated Birthday ;0). Read you soon! Yes, please?! Thank you, Stella! I, too, enjoyed Raclette while studying in Switzerland. I laughed at your comment with regard to it initially smelling like “dirty socks!” I had forgotten about that part of this delicious dish. I had a good laugh from a fond memory! Hi there Joan! Ooh, so glad you are a lover of stinky socks, uh I mean raclette too ;0). Thank goodness it doesn’t TASTE like it smells, huh? LOOOOOOOOOOOOVE cheese. My secret fantasy is learning to make my very own! And one of the top best things about living in Europe? – the CHEESE! In Portugal they have one that is somewhat similar to Raclette – they serve it whole, and cut an opening in the wax at the top and center, and inside you’ll find melted flavorful deliciousness. Mmmmmmm…. OK Michi, my mouth is watering, happy? ;0)°°° Oh, by the way, found this site by accident and thought of you, have fun! Ohhh, raclette! I absolutely adore it! Hi Maja, sounds like you, Michi and myself need to go to some ‘cheese anonymous’ meetings, lol. 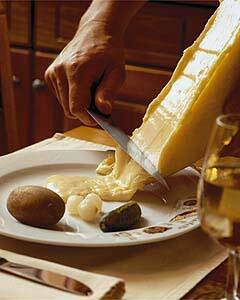 So glad you are in the raclette fan club ;0). Thanks for reading and commenting!